The previous three posts addressed biocompatibility concerns of 3D printed devices considering additives to the raw materials, the material curing process, and post-printing finishing processes. Both thermoplastics and photopolymers contain additives (oligomers, plasticizers, preservatives, etc.) that are freshly redistributed through the printing process. Following printing, consideration must be given to the amount of time required for aeration of the device before use to allow additives near the surface to diffuse and volatize from the surface. Aeration of additives out of a device can be compared directly with aeration of ethylene oxide (EO) residuals, which is commonly used for in-package sterilization. Desorption of EO, and its residual byproducts, is a common concern for medical devices sterilized with this sterilization method. The amount of time required for aeration depends on the device materials, geometry, and concentrations of additives of concern. 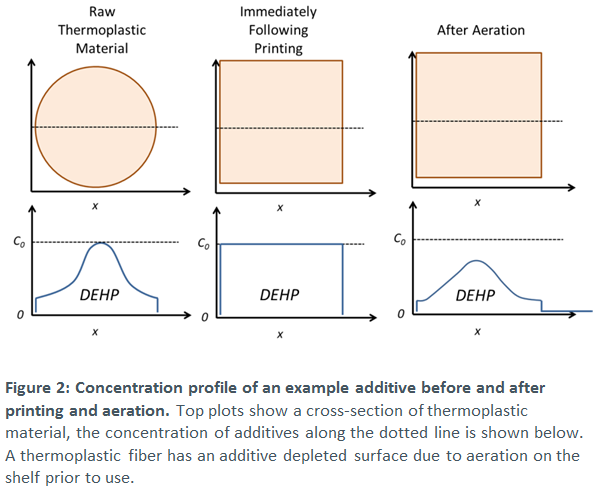 While calculation of precise aeration times for 3D printed plastic additives is outside of the scope of this blog post, the need for adequate aeration is well illustrated by examining the law of diffusion governing the desorption of volatiles from a solid, and by comparing the diffusion coefficients of plastic additives to that of EO gas. 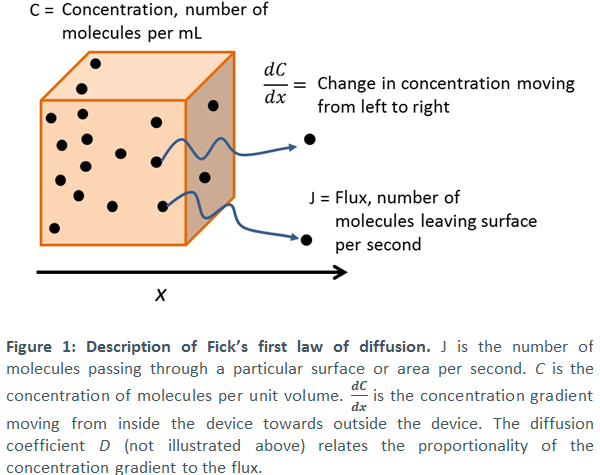 Desorption of EO or a plastic additives is limited by the ability of the chemical to diffuse to the surface of the device (Figure 1) and so is well described Fick’s laws of diffusion. Fick’s first law states that the number of molecules diffusing through a particular surface per second is proportional to both the diffusion coefficient D (which depends on the aeration temperature, the molecule’s size, and surface geometry) and the concentration gradient dC/dx of the chemical across the surface. A larger diffusion coefficient and greater concentration difference lead to faster diffusion and desorption from a material. As explained in part 1 of this blog series, when a raw thermoplastic material goes through the 3D printing process any additives are redistributed evenly through the printed material. Likewise, unreacted photopolymer precursors and other components are distributed throughout 3D printed photopolymers. Even distribution results in a large concentration gradient of the additives at the material surface, where the concentration goes from the full formula concentration just inside the surface to zero outside. The large initial concentration gradient leads to an initial strong desorption, which tapers off slowly over time as the material develops an additive depleted surface. As an example we will consider EO and the plasticizer diethylhexyl phthalate (DEHP) in polypropylene (PP), for which diffusion data is readily available. Suppose we wish to print PP which has a 0.1% by mass concentration of the plasticizer DEHP. A typical device might weigh 20 g, which leads to 200 mg total DEHP. The raw material is a resin fiber which is well aerated prior to use, resulting in a thin additive depleted layer on the surface and a very low rate of desorption. During the printing process, the resin is melted and drawn through a very fine nozzle – redistributing the DEHP evenly throughout the material. Immediately, DEHP along with other volatiles start to desorb off of the material into the surroundings. The process slows exponentially as a depleted layer forms over the surface until – eventually – the material again resembles the raw material (Figure 2). The amount of time required for this process is directly related to the diffusion coefficient of the compound in the material. DEHP has a diffusion coefficient in PP of 3.8×10-11 cm2/s at 40°C, while EO has a diffusion constant in PP of 5.9×10-8 cm2/s at 40°C; this means that DEHP diffuses approximately 1,500 more slowly than EO. This is why that new car smell we all love, which is a cocktail of plasticizers and other additives, lasts long after the car leaves the factory. A typical EO sterilization process allows for 24-48 hours of heated aeration time, though many companies choose to follow this with additional days of ambient aeration. Based on a comparison of diffusion coefficients, the amount of time required for aeration of 3D printed medical devices could be significantly longer depending on the concentrations and types of additives. The diffusion coefficient and rate of desorption increase dramatically with temperature, so any post-printing sterilization steps at elevated temperatures may facilitate desorption. Decisions regarding the aeration time needed for 3D printed polymer devices should be based on observation, taking into account all post-printing steps and understanding that desorption will continue slowly over time. As 3D printed medical devices continue to rise in popularity, so will the scrutiny on their biocompatibility. Assessment of these devices should consider not only the raw materials used, but the curing parameters, post-printing finishing processes, and aeration time.